Boston Omaha is a Berkshire-like holding company that has larger long-term growth potential due to its smaller small. It has begun investing heavily in the billboard advertising space, with plans to grow its market share in this area with acquisitions. It is currently valued at today’s prices, and is well-run company worth initiating a small starting position, which can be added to at a later point in time at better. 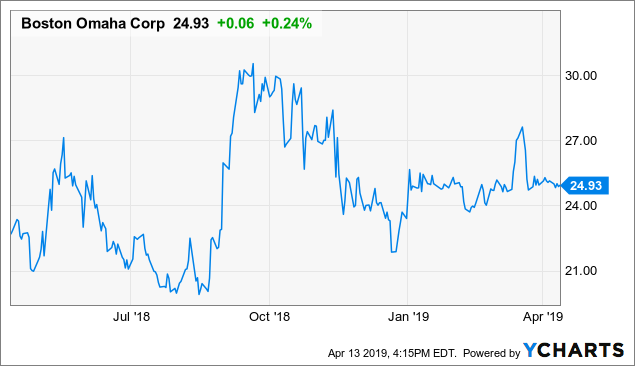 Investors should set their eyes on Boston Omaha Corporation (BOMN), a holding company with a growing portfolio of businesses that could potentially compound investor’s capital at a satisfactory return, and likely higher than they could earn on their own. Management has been intensifying acquisition frequencies, with the latest being a full dive into the billboard management business, having owned $178 million in billboard assets as of the end of 2018. Management is still looking to acquire more billboard assets, adding to its 5,400 advertising faces. We expect this to be an area of growth for the company moving forward. Its growing insurance operations and minority stakes in other profitable companies should also provide a steady rate of return on capital, while management continues to deploy capital to fuel its growth. Boston Omaha Corporation mirrors the operating of structure and modus operandi of Berkshire Hathaway (BRK.A) (BRK.B), owning operating businesses outright and having minority stakes in attractive businesses which deliver capital gains and dividends. Currently, the three main sectors under its umbrella are advertising, insurance, and real estate. It has recently completed additional share issuance in 2018 and raised cash to fund additional future acquisitions. Some of this capital has been deployed, and approximately $110 million in cash is sitting on its balance sheet as dry powder ready for acquisitions. The management team for the company is lean, with interests well aligned with minority shareholders as the co-CEOs control more than 50% of all stocks outstanding. While some may have reservations on founder-controlled companies destroying value and harming minorities financially, management has been transparent in its disclosure, making the effort in producing annual letters detailing business operations and risk factors. Incidentally, Mr. Rozek, one of the co-CEOs, is the grand-nephew of Warren Buffett, current CEO of Berkshire Hathaway. However, investors should focus first on the underlying businesses and its fundamentals rather than relations with other successful company executives, such as Buffett. Insiders had recently increased their stake in the stock at prices above current levels of $24.93. The company has been on an acquisition spree in the billboard advertising space lately, driving up billboard rental revenues for the company. The company had recently turned operating cash flow positive in 2018, compared to 2017, based on latest 10-K filings, from a deficit of $3.2 million to an inflow of $38,325. Management has not been spending significantly in order to chase revenue growth, while it has been actively reducing land cost as well. Net loss per share has been steadily decreasing as well, from $0.60 per share in 2017 to $0.46 per share, signifying improved cost controls. Management has been sticking to its mantra of buying billboards that have decent cash yields and favorable occupancy rates, and its discipline in doing so has started producing positive results. The billboard business is dominated by other big players such as Clear Channel Outdoor Communications (CCO), OUTFRONT Media (OUT), and Lamar Advertising (REIT)">LAMR), totaling more than 50% market share of the total outdoor advertising billboard revenue. Management has set its sights on building on its acquisition spree with the ultimate goal of delivering steady and improving rates of ROIC through gaining more market share in this space. The total estimated industry value for billboard advertising is $8.6 billion, and it is only scratching the surface at current revenue levels of $14.1 million. The billboard industry is a great opportunity for Boston Omaha to increase its growth in the coming years. Boston Omaha’s insurance operations are also producing satisfactory growth rates, increasing premiums underwritten at a rate of 200%. Management is right on emphasizing the need for strict cost controls and underwriting discipline, with below industry-average loss and loss adjustment expense (ratio). Management is investing in automation by leveraging technology to reduce customer acquisition cost. Capital business is highly competitive, but its sound management can make a huge difference to the bottom line. Management has reiterated the competitiveness of the insurance industry, in line with our understanding of the capital business in an era awash with liquidity, hence the need for controlled growth. Another positive growth avenue for Boston Omaha is the growth potential of its underlying businesses. While its stakes are relatively small in each business, being small and profitable could potentially deliver huge capital gains over the long-term. All three minority investment operations are independent profitable businesses, with it having realized a profit on invested capital in Logic Commercial Real Estate. Dream Finder’s Home, another profitable outfit, has an outstanding return on equity and room for improvement as well. It managed to deliver 26.7% more units of homes compared to 2017 and is performing steadily in raising market share compared to another solid finished lot homebuilder NVR, Inc. Its stake in CB&T Holding, a bank operating in a niche segment of disbursing subprime auto loans, has a long operating track record and competitive funding cost advantage which has yield decent returns upon investment. Boston Omaha is currently trading at a valuation of 1.8x book value, considered premium by holding company standards. The company is still in acquisition mode and its share price, at last close of $24.93 has been hovering at a smallish 7% premium around its last private placement price of $23.30 per share. In the case of valuing Boston Omaha, we rely most heavily on the P/B ratio and its comparison to similar companies. In comparison to similar businesses, Markel Corporation (MKL) and Fairfax India Holdings Corp (OTCPK:FFXDF), Boston Omaha appears expensive on a P/B basis at today’s price. Boston Omaha is currently trading at about 1.8, while Markel and Fairfax are trading at 1.53 and 1.02, respectively. Although each of these businesses have characteristics that might make them more or less attractive than Boston Omaha for some investors, such as size, location, etc., we believe the two latter companies display more opportunity for investors than does Boston Omaha. Therefore, Boston Omaha should trade at a slight discount to its peers, which it does not do currently. That being said, we do believe Boston Omaha is a good company to own for the long-term. Ideally, investors should wait for a slightly better price to enter a major position. However, now could be a good time to start a small initial position, which can be added to if, and when, better prices are available. With improved cash flow outlook, its underlying investments and business operations providing steady growth, a strong management team, and a cash pile unconstrained by typical private equity restrictions on acquisitions, Boston Omaha is a company investors should at least add to their watchlist, if not start a small position. Management’s aversion to excessive debt and careful investment appraisals should serve investors well in the long run. By treating its investee companies as partners and holding a long-term view, Boston Omaha would serve as a good vehicle for compounding investor’s return financially. For long-term investors looking for a Berkshire-like investment with more growth potential due to its size, we recommend starting a small position and adding to it at opportune prices.